So what about querying related tables? The joy of SOQL is that not only does it let you query a single object, but it also lets you query any related objects. How cool is that! As a Salesforce admin, you know how to create formula fields that pull data from a parent field into the child. You also know that you can aggregate data from children up to a parent record. SOQL has ways to pull data from children to parents and vice versa. Let’s tackle the easiest type of relationship direction first, pulling data from a parent to a child. The code snippet below shows how we could grab the account name along with the contact name for any contact whose email address is ‘jane.smith@CookingWithCode.com’. * This is rather clever of Salesforce, as it ensures that nothing will break if they happen to add a standard object with the same name as our custom object. Imagine our contact object includes a custom lookup field to reference the contact’s favorite recipe. (I couldn’t resist putting a cooking reference in here somewhere!). You’ll notice that I’ve snuck in another comparison operator: !=. Not only is this just so darn cute to write, but it’s also fun to say. It means Not Equal to (and I like to stamp my foot a little when I say it). The “!” equates to the “Not” (and the foot stamp). You can also use “<>” instead of “!=”, but it doesn’t seem like I should stamp my foot with it, so I just don’t like it as much. Not really. If you exported the contact record, what’s actually being stored in this custom field is the ID of the recipe. If we want the actual name, we have to travel up the relationship from the contact to the recipe and get the name. Are there limits on relationships?? More information on limits is on the Relationship Queries Salesforce documentation page. So now that we know how to look for data in an object, and related parent objects (both custom and standard), what about moving down the relationship path from a parent to its children. There are many reasons why you would want to pull data from the child or children related to a parent. Many of these have analogies to various types of Salesforce reports. A Show child data along with parent data in a flat file (e.g., account name and all the names of contacts within that account). Creating a tabular report that includes contact and their account information.In reality, in a report, we this is all just one Accounts with contacts Report Type, but I wanted to show you what it looks like to pull data from the other direction, which is be very helpful in Part 3 of our series. B Filter your query by entries in child records (e.g., find me all contacts whose favorite recipe is “Pavlova”). Creating a report that uses cross filters, e.g., accounts WITH opportunities that were “Closed Won” with a total amount over $100. C Calculate aggregate data from a parent record’s children (e.g., total value of opportunities) Close-won opportunity summary report, with opportunities grouped by account, including a summed opportunity value. 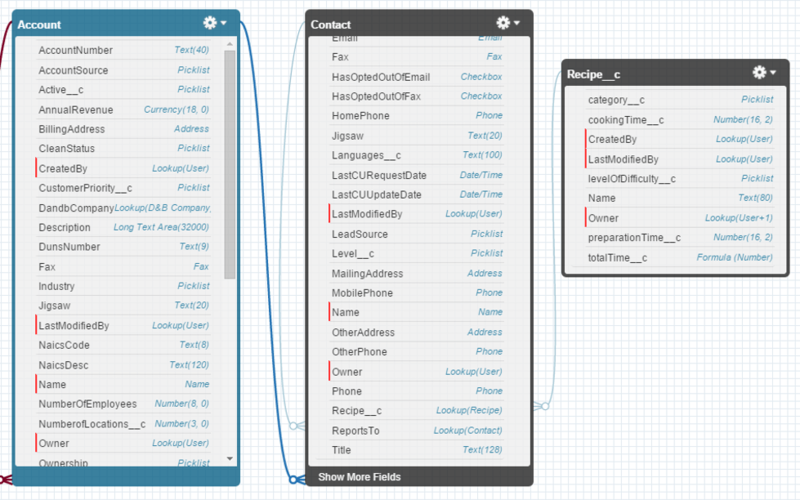 Just as the reports above pull data using the Salesforce Report Builder, so too can we pull the same data using SOQL. We’ll work with Scenario A and B in this blog post, and save Scenario C for the next. Phew! Take a deep breath, and repeat after me “I am okay…I can do this.” Now let’s tackle this piece by piece. You can probably see that there is a difference in the SOQL result set and the report result set. The report returns two rows (one for each contact), while the SOQL returns only one row. If you look carefully at the SOQL results, you can see that while there is only one row (for the single account), that row’s “Contacts” column contains the data for both the contacts related to the Baking Supply Co account. The first part of line 1 is also pretty straightforward: select the account name. But what are we doing with the second part of line 1? We’re running what is called a “subquery”. It is SELECTing the firstName, lastName and email fields FROM the contact, and displaying them along with the other field we’ve included in the first part of the select clause. We don’t use dot notation, because that only works from the child to the parent, not from the parent to the child. For standard relationships, we use the plural version of the subquery object name (e.g., contacts instead of contact). For custom relationships, this could pretty much be anything, but it will be whatever is set up in the Child Relationship Name within the Field Definition. The subquery is surrounded by parenthesis. There is a comma between all the account fields and the subquery. Creating an account report of all accounts WITH opportunities that were “Closed Won” with a total amount over $100. Again, deep breaths and we’ll step through this together. Line 1 is pretty standard, we are SELECTing the name and industry fields from the account object. Line 2, also pretty standard, we’re adding a filter that is asking for just the accounts WHERE the id of the account is included IN a list. Remember back to Part One in this series, where we used IN to pull out all accounts within the western states? This is the same kind of IN. But Yikes! What are we doing in line 3? This is just like the first IN statements we saw, but instead of hard-coding the values into the list, we’re pulling them from the database using a subquery. WHERE the opportunity stageName is “Closed won” AND the opportunity amount is greater than 100. Once that subquery runs, it will automagically return a comma delineated list of account IDs that we are then using to compare the ID for the account object in line 2. We’re officially at the end of Part Two of our intro to SOQL and I hope that it was satisfying; not too salty, not too sweet, and left you wanting more! Don’t worry! Next week I’ll be giving you the third and final part of “A Sweet Intro to SOQL,” where I’ll tempt you with some more sassy SOQL concepts, like aggregates, advanced operators and wildcards, working with dates and numbers, and some more advanced WHERE conditions.